Stunning effects specially for gaming niches at your choice. Virtually no one could foresee how important gaming will become in the 21st century, even though video games have been a part of the popular culture since the early 1980's. In February 2018, the first E-Sports event was held at the winter Olympics, and it can be expected that it will become a medal event no later than 2024. Video games are no longer regarded as a pastime since players can earn substantial amounts of money just by playing E-Sports tournaments, while companies that produce video games gross billions of dollars annually. Scroll down to learn more mind-boggling facts about the world of video gaming from the infographic created by the Filmora's team, and make sure to share your opinions with us. The gaming market has been growing steadily for a couple of decades, and in 2018 it has reached historic numbers. 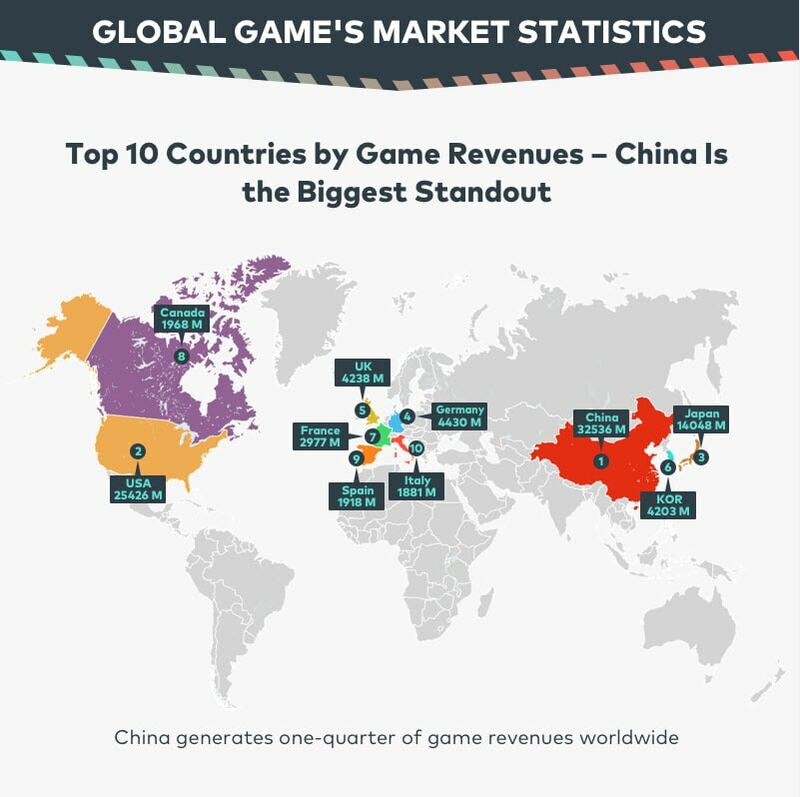 China, the world's largest gaming market seems to be leading the way in terms of revenue generated through video games. In 2017, China produced one-quarter of all gaming income worldwide, more than USA and Germany combined. Furthermore, China's Tencent company was ranked as the 9th largest company in the world, just behind JP Morgan and slightly ahead of Wells Fargo. 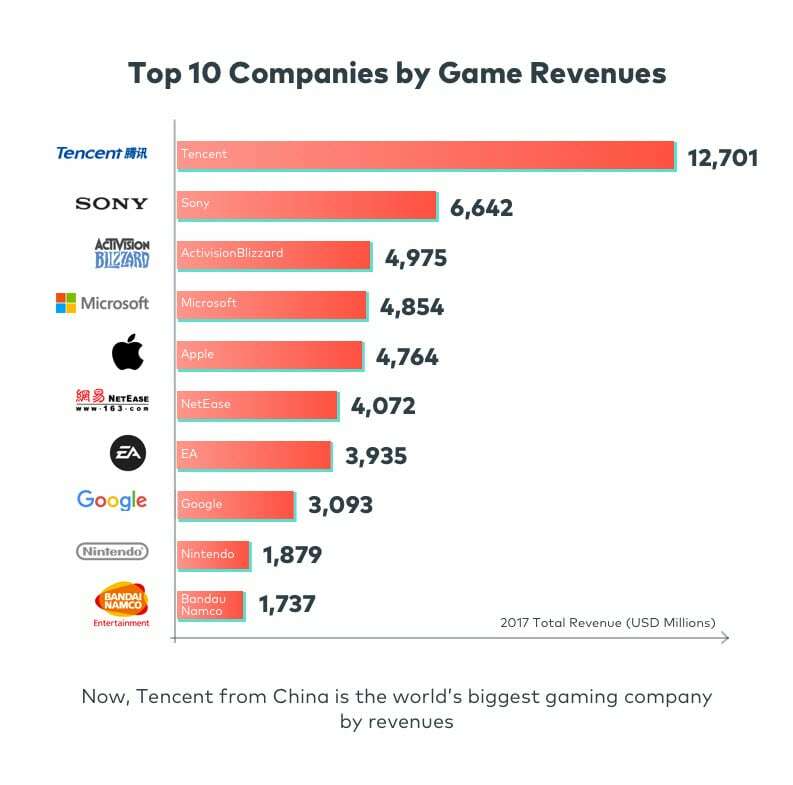 Tencent is currently the world's largest gaming company, and some predictions say, that if it continues its growth at this rate, by 2025 it could also become the largest company in the world. These facts show how important gaming has become for the global market, and that its importance will continue to grow in the next decade. The popularization of video games has been magnified by mobile gaming, and last year, 42% of all gaming revenue was generated through mobile games. Furthermore, as the mobile industry continues its dazzling success, the $115 billion that will be spent on gaming in 2018 will become the lower threshold for worldwide earnings from gaming. Currently, the Asia-Pacific region is home to nearly 1 billion of gamers, a half of the entire gaming population in the world. Although gaming is often associated with younger generations, an approximate 15% of gamers worldwide are aged between 51 and 65. In addition, 63% of all gamers in 2018, are from 21 to 50 years of age. These numbers clearly show that video games are played much more frequently by adults than the teenagers or children. 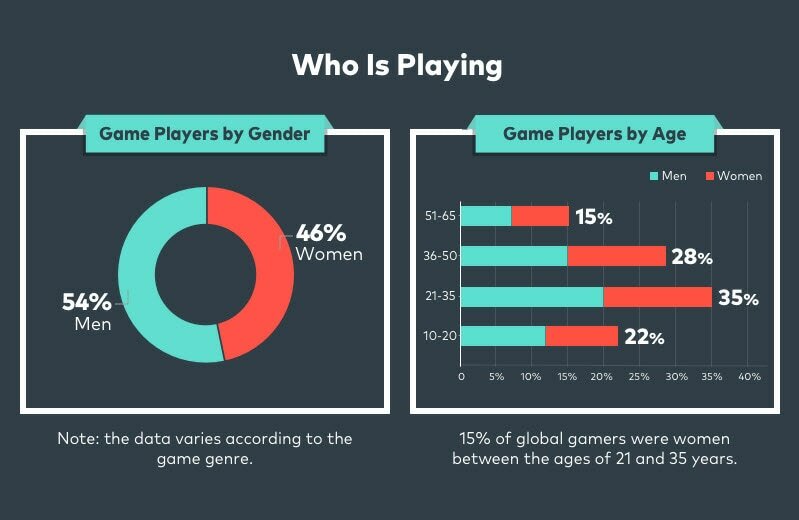 Men spend more time playing video games than women, but these numbers vary in different gaming genres. For example, women prefer video games that don't involve violence or athletic competitions, while men often like playing shooter or sports games. Arcade, simulation, and puzzle games are more popular among women, while male gamers enjoy playing strategies, action games or adventures. 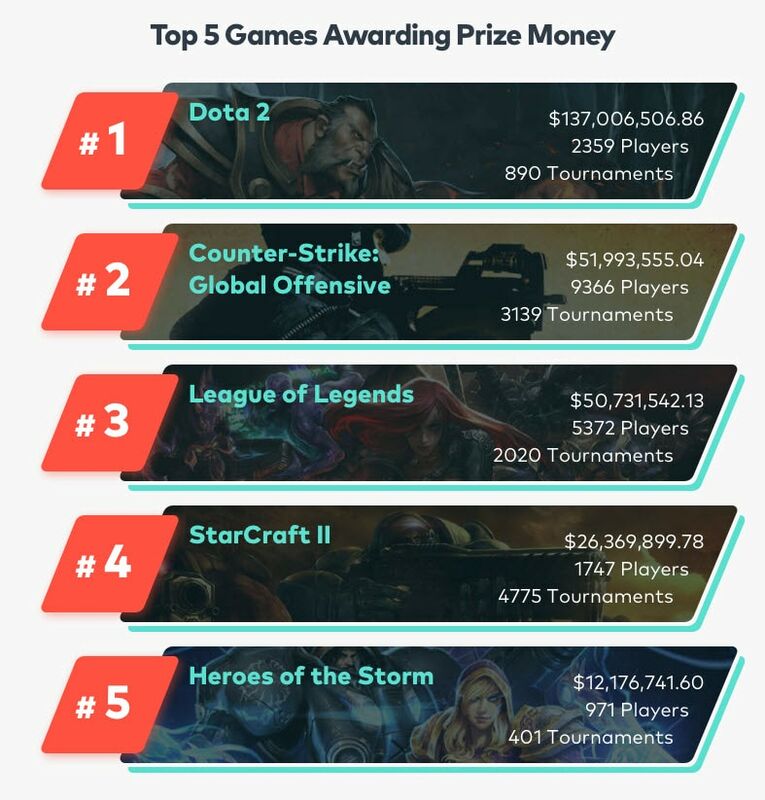 Being a gamer is no longer unprofitable because just the tournaments organized for Dota 2 players have a prize money budget as high as $137,006,506.86. In addition, the numbers of Esports audiences are on the rise and estimations say that in 2018 it could reach staggering 380 million people. Furthermore, Esports revenues could surpass $1,6 billion as soon as 2021, yet another indicator that gaming will have a huge impact on the world's economy in the near future. Nearly 40% all Esports revenues comes from sponsorships, a number that is expected to rise as the plans for the First standalone Esports Olympics become more than just a faint dream. Currently, there are thousands of gaming tournaments around the world and gamers with enough skill can easily earn thousands of dollars in prizes, which suggests that gaming can become a profitable occupation instead of a hobby which it has been throughout much of its history. The rapid development of computer and Smartphone technologies we have witnessed since the turn of the century has enabled gaming to become an industry that generates billions of dollars annually. This trend is likely to continue in the coming decades since all the statistics indicate that the number of people around the globe who enjoy playing video games is on the rise. Let us know what is your opinions about gaming in the comments section and feel free to hit the share button if you think that your friends should see this amazing infographic created by the Filmora's team.